Next Friday we move out of this home. My partner has lived here for 32 years and I joined her fourteen years ago when the new millennium was a few months old. 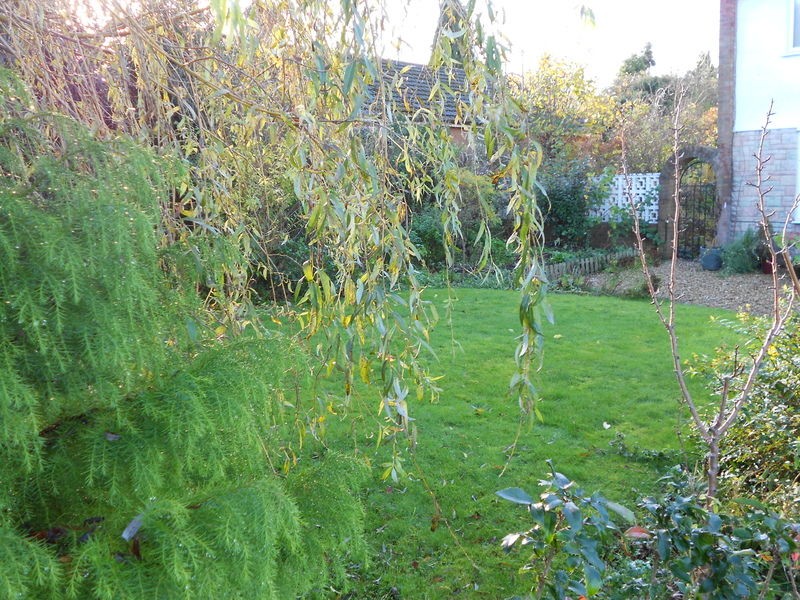 Needless to say we have a lot of packing and sorting to do which meant that today was my last chance to get out in the garden – harvest a few things – and to say a sad farewell. 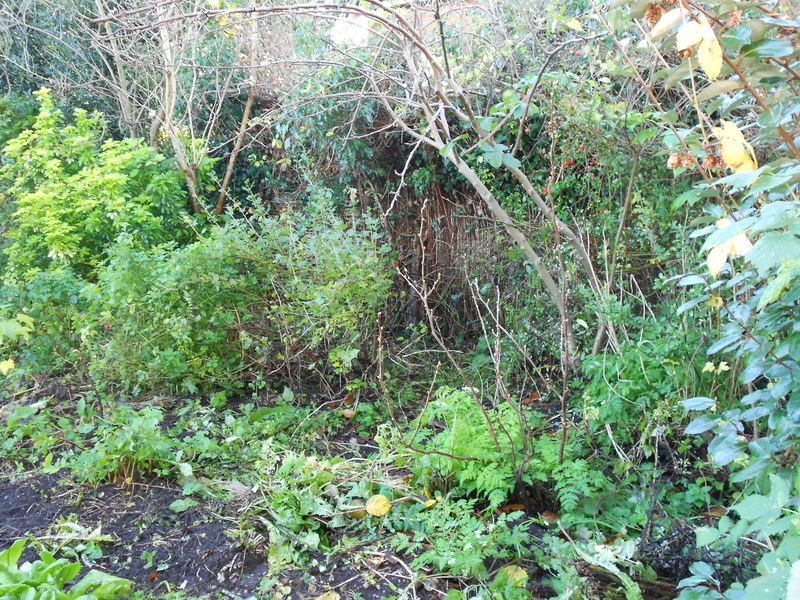 I have removed the perennial vegetables from the back garden now and what remains are herbs, wild strawberries, wild flowers with an edge of shrubs. 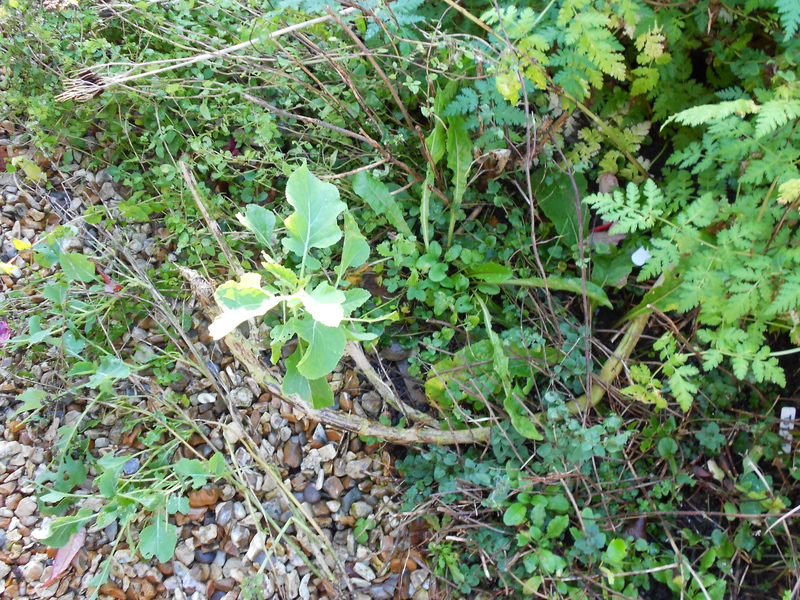 This may not look like much of a plant but it is a red Russian kale that I have had for many years. 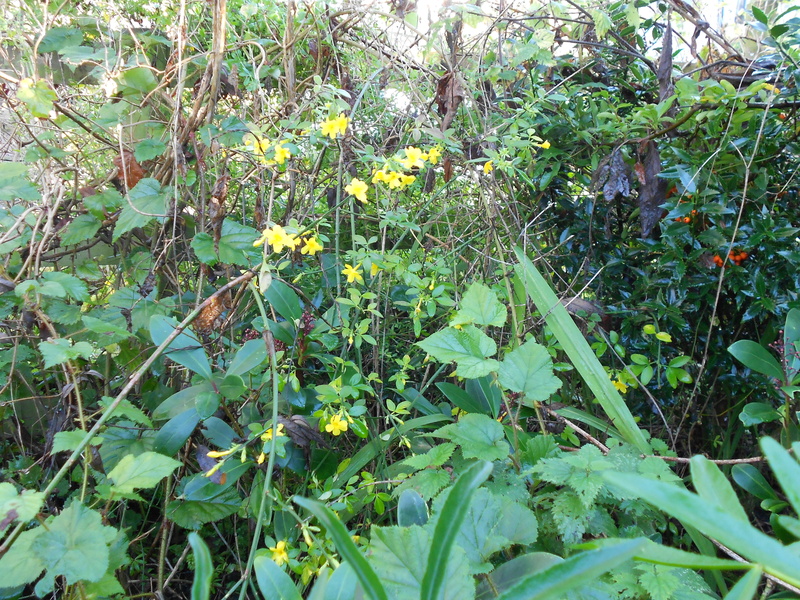 It lost its redness a long time ago, but has been a really, really hardy and useful plant. It will live on via the many cuttings I took a few weeks ago which are already sprouting. 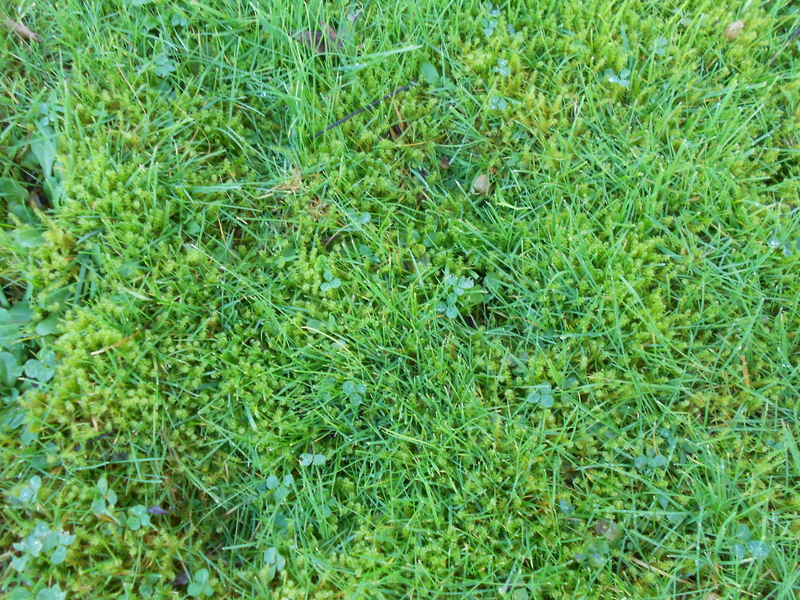 although the lawn is mainly moss. 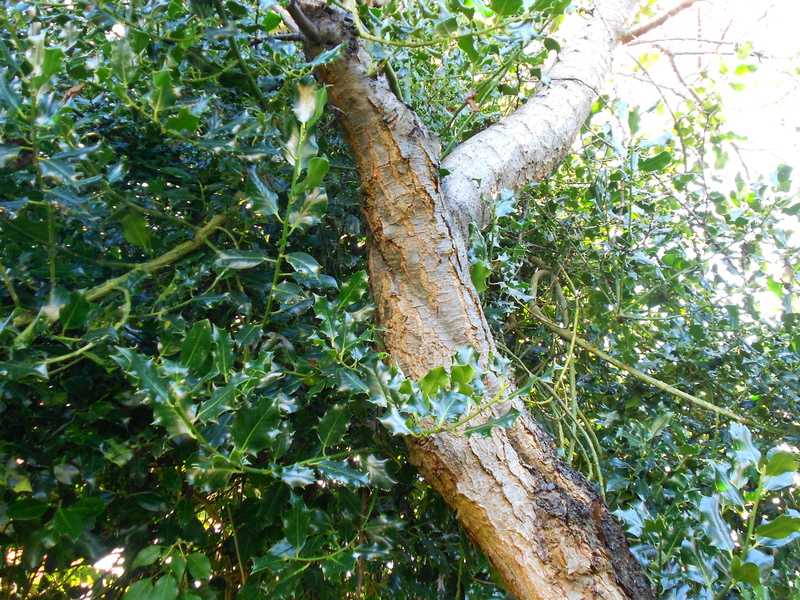 and this gnarly old trunk belongs to a very old greengage tree. 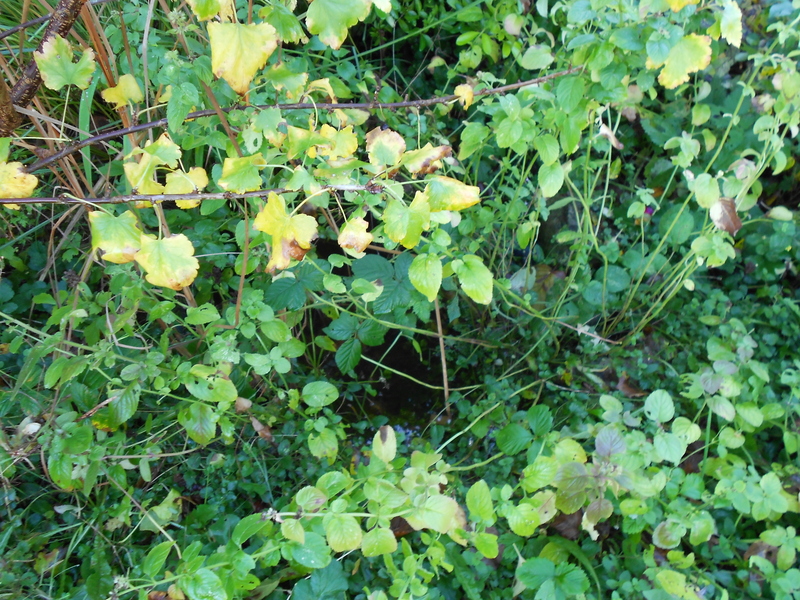 It is hollow on the other side and hardly able to produce any greenery or fruit. The garden was once part of an orchard belonging to a manor house and this plus other fruit trees in the neighbourhood is a survivor from those long lost times. In contrast the holly bears its vivacious berries most years. It was the tendency of the garden to be somewhat wild around the edges, (as well as damp and shady) that first set me thinking about growing different things here. 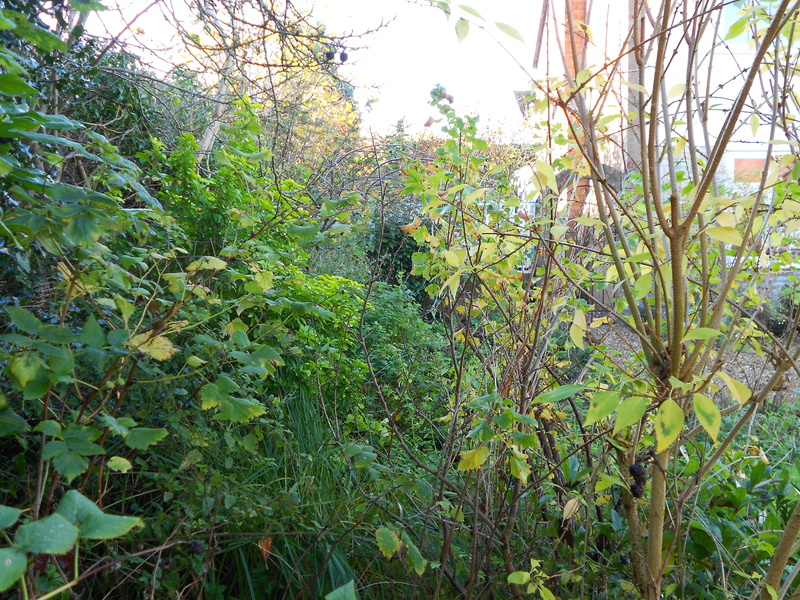 I used to try to tidy up much more but since learning about forest gardening and permaculture I have totally relaxed about that and really love the way plants intermingle and entwine themselves. 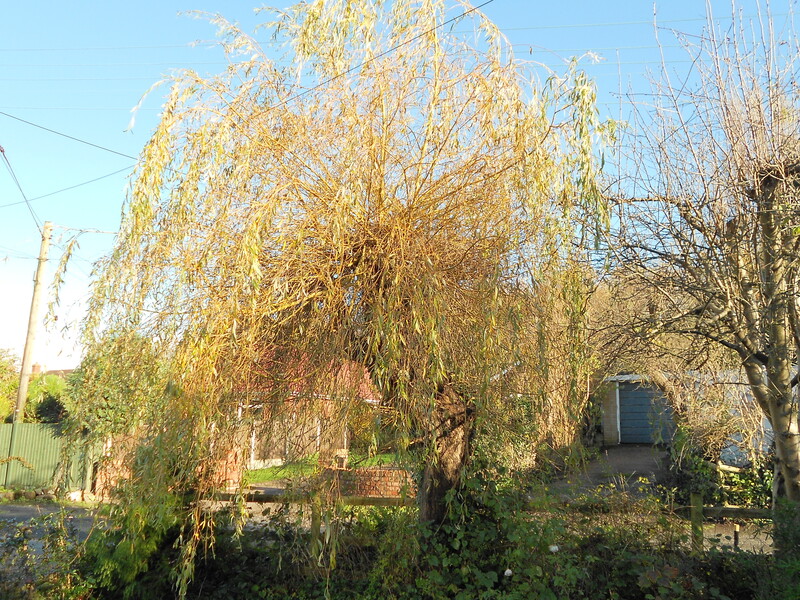 We have a beautiful willow tree which gets its water from a stream in the front, however it needs regular pollarding to stop it getting too massive. 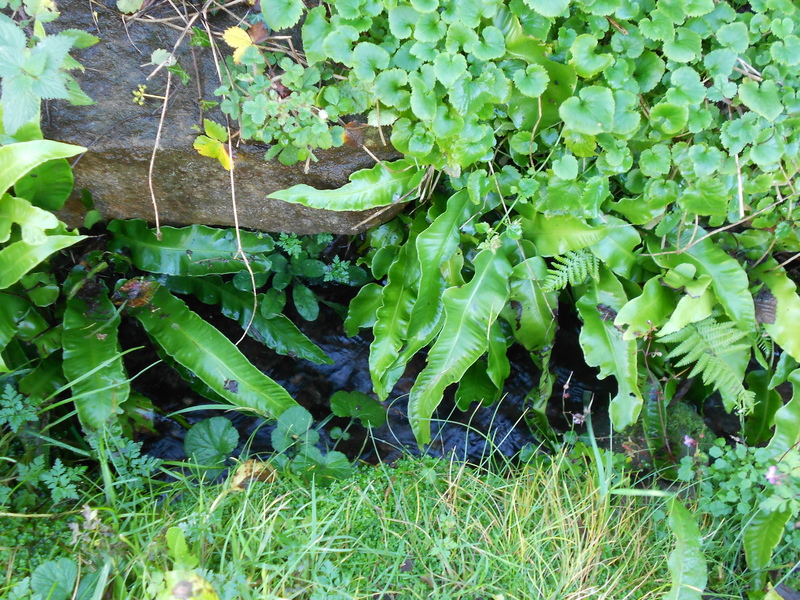 There are abundant ferns on the stream-side which I used for mulching the garden when they got too large. 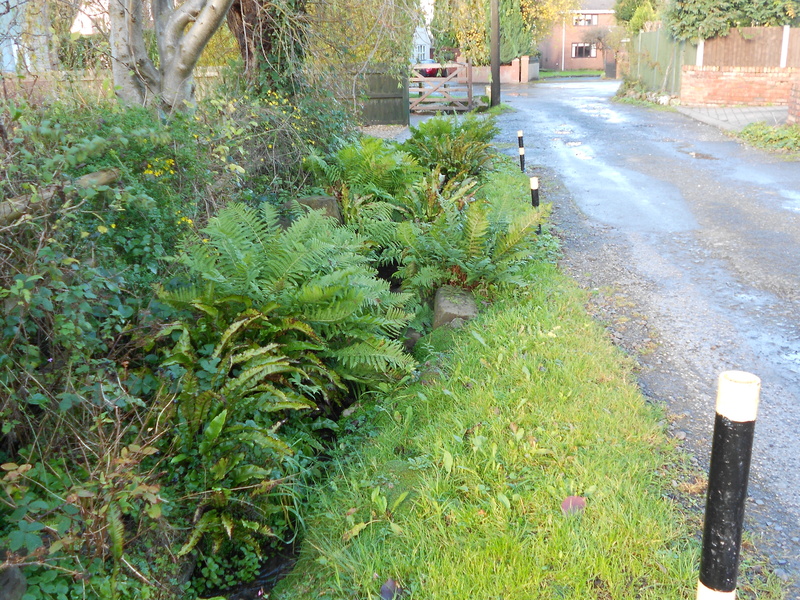 with the stream gently trickling alongside. 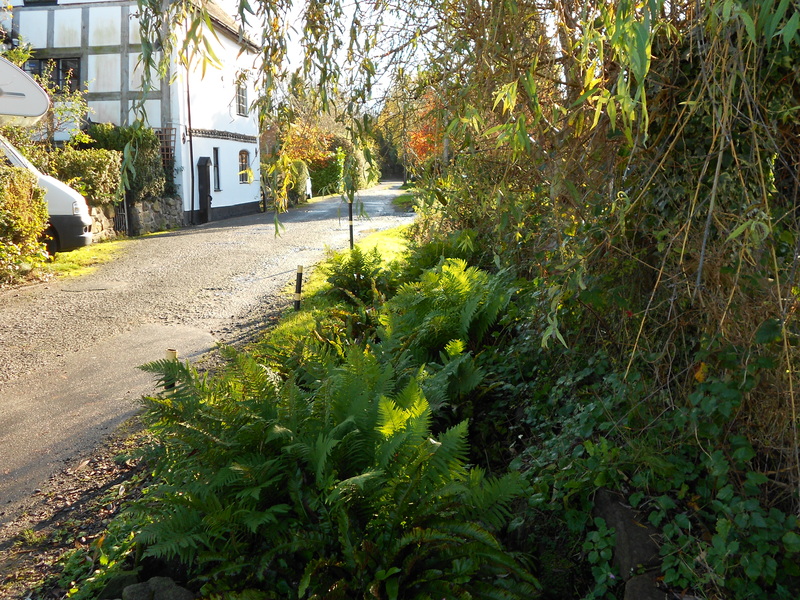 Despite living close to the motorway, retail park, the college, football ground and station the house is tucked into its’ own little corner of peace and tranquility. 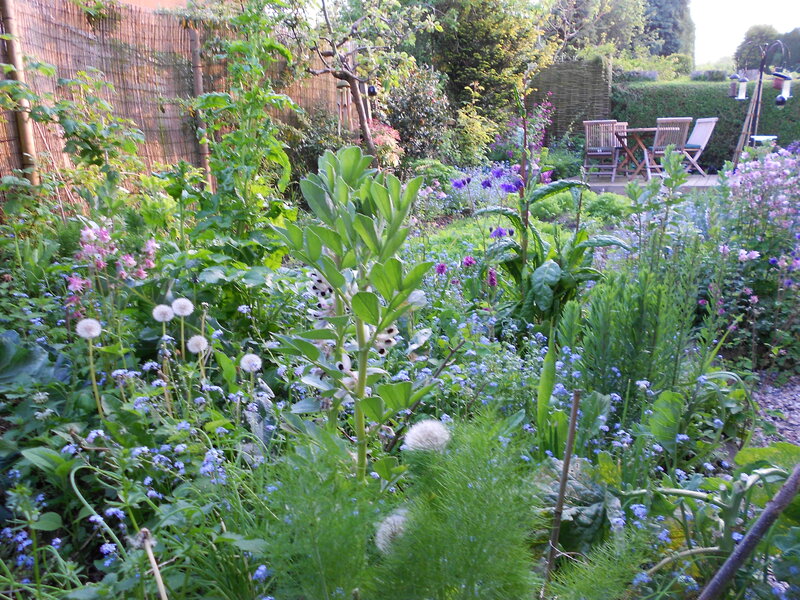 And this is how I will remember the garden – on an afternoon in late spring – exuberant, abundant and vibrant with life; the perfect place to sit and unwind after work! 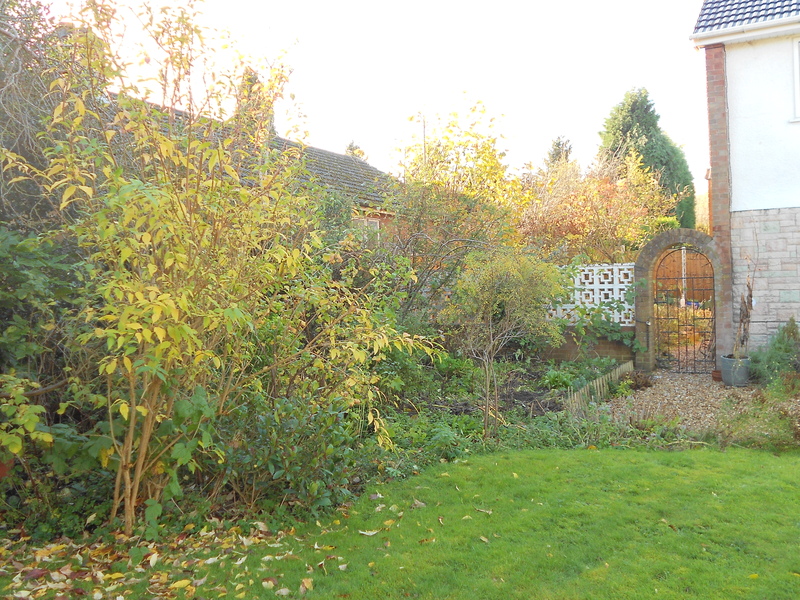 This entry was posted in Edible Perennial Gardening, Telford Garden. Bookmark the permalink. Good luck with your move. Hope it isn’t too hard to say goodbye. Sad to be leaving a garden and home that you love. But remember, the knowledge you’ve gained goes with you. Will you continue to blog and garden from your new place? I hope so. Huge luck! It’s a wrench, isn’t it? 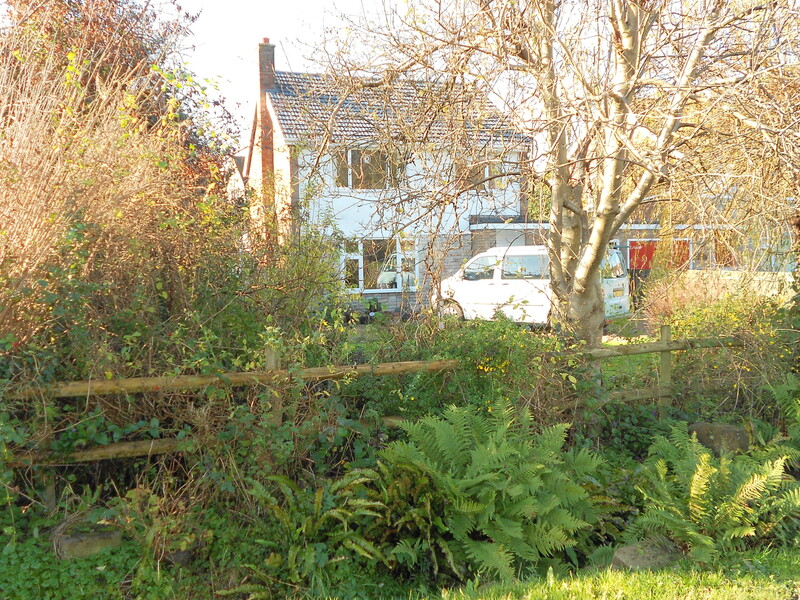 But I’m sure your new garden will provide you with every bit as much enjoyment once you’ve settled in fully. Hope the move goes well tomorrow. Good luck! I mean, I hope the move went well. 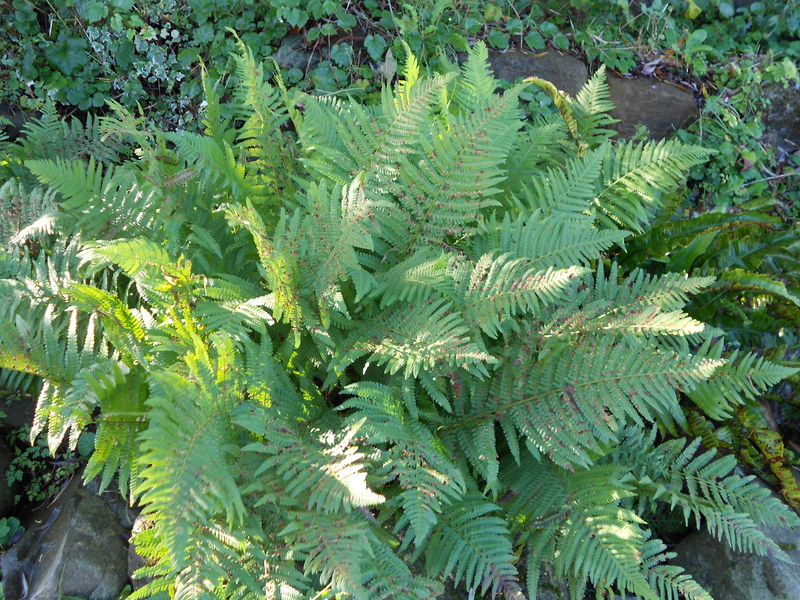 Does mulching with fern have any special benefits as compared to other large leaves? 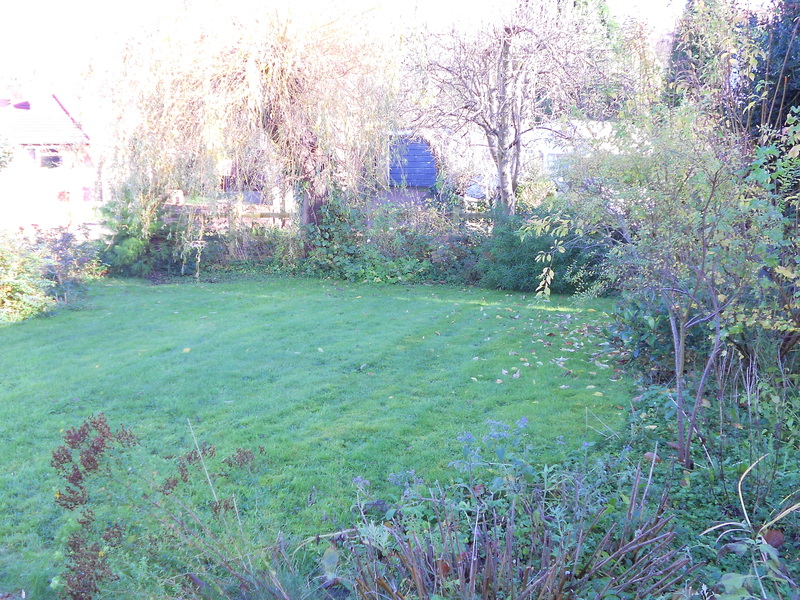 Also, heh, the mossy ‘lawn’. Mine looks the same. I’ve never understood why people prefer grass and go to such lengths to fight moss in their lawns. I mean, the moss soaks up rain like a sponge and prevents run-off / wash-outs, as well as providing moisture for the wildflowers and earthworms, so you don’t have to water the space. And even if it gets very dry in high summer, it’ll at least look green, and the same in winter when the grasses die back. Plus, it’s wonderfully soft to walk on. I’m in complete envy at the little stream, though. I would love to have a natural water feature. The best I can do without wasting energy for pumps is a little bird bath under each dripping faucet.